US President says negotiations are underway on location of his next summit with North Korean leader Kim Jong Un. 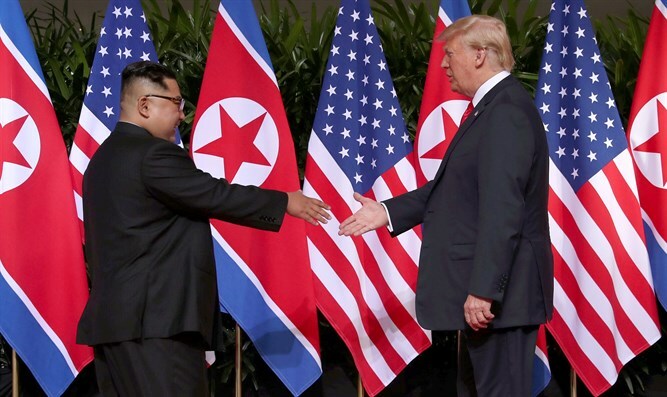 US President Donald Trump said Sunday negotiations are underway on the location of his next summit with North Korean leader Kim Jong Un, though he did not say when the summit will take place. "We are negotiating a location," he told reporters before boarding a helicopter for the presidential retreat at Camp David, Maryland, according to AFP. "It will be announced probably in the not too distant future," he said of a summit with Kim. "They do want to meet and we want to meet and we'll see what happens." "With North Korea, we have a very good dialogue," Trump added, saying he had "indirectly spoken" with Kim. Trump's hopes of arranging a follow-up summit have been at a standstill. The North Koreans recently abruptly called off a meeting in New York with Secretary of State Mike Pompeo. Last week, in a New Year’s message, the North Korean leader said he is willing to meet Trump “at any time”, but also warned he would seek a “new path” if the United States continues to demand unilateral action from North Korea. Later, however, Trump said Kim had sent him a “great letter” and added, "We really established a very good relationship. We'll probably have another meeting." On Sunday, Trump still made clear the US sanctions on North Korea remain "in full force and effect" and would be in effect until the United States saw "very positive" results. Trump has cast his first summit with Kim as a major diplomatic victory, and on Sunday repeated his claim that there would be war in Asia had they not sat down to talk. "Anyone else but me, you would have been at war right now ... You right now would have been at a nice big fat war in Asia with North Korea if I hadn't been elected president," he said, according to AFP.